The goal of the Sustainability Demonstration House team is to take an existing house in Houghton and retrofit it to be energy and water efficient, as well as demonstrate sustainable practices with the community. 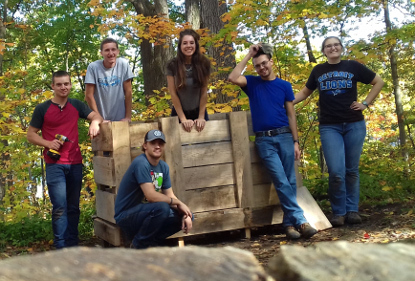 This year, the team has been working on plastic recycling, aquaponics, rain barrel irrigation, power meter, and indoor composting projects. The goal of the plastic recycling project is to take the plastics that the tenants in the house use and melt them down into 3D printing filament and/or millable bricks. The first product we will create using this recycled plastic will be address numbers to put on the outside of the house. The aquaponics system in the house is a water-cycled system that takes waste from fish in an aquarium and uses that waste as food for plants, which can in turn be harvested. The only input needed for our system is fish food. Rain barrel irrigation will be used to water the garden in the backyard with water that is collected from the roof of the garage. The water is then automatically sent to the garden when it needs watering, based on the soil’s moisture. The power meter project takes power samples from the main power line in the house and uploads that data to the cloud. This data will be used to test the efficiency of future energy upgrades to the house. The SDH currently has an outside composting system in the backyard that is used in warmer months. The team is now experimenting with ways to compost indoors effectively and without disrupting odors. Recently, Whirlpool donated a Zera recycler to the house, which can be used to grind up and heat waste into compost. The team also has Bokashi mix which uses microbes to break down the waste while reducing odors. Or fill out an application to live in the SDH!